I’m happy to report that I wasn’t too terribly tempted by anything out of the huge shipment my store got today. I was mostly tempted to get another Post Run Pullover in Wish but I’m holding back because I want to see how well my Very Violet one wears. I’m in need of mitts but didn’t love the selection I saw in store. I think if I’d seen some items in Multi State of Mind print I probably would have lingered some more. A lot of the new items today (Silverescent Luon) were all black, and the other items were full of ruffle details that I wasn’t really in the mood for. My mood today was more along the lines of *brrrrrrrrr*. All Colors of the Post Run Pullover. I’m eying Wish Blue. New Define with Ruffle Detail..cute subtle ruffle on this. SE Cool Racerback Tank. I really thought this was a cute and subtle ruffle. I was momentarily tempted by this Coal and Very Violet one. I put it back because I always layer my Cool Racerbacks unless it’s hot, hot out so the special ruffle detail would not be seen until the summer. 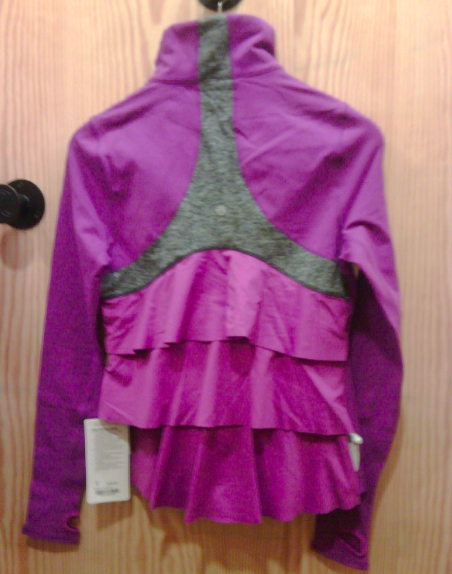 And a horrible shot of the same ruffle detail on the newest Stride. I’m dubious of Strides these days. Yogi Dance Jacket. Did not care for this. I almost grabbed the mitts today for $34 as it is freeeeeezing blizzards out today. (-4 and very windy) in the end I put them back because they are pretty big on me and it’s too hard to maneuver around with kids with huge chunky mittens on. Made of Rayon derived Bambo blended with Cashmere. The same fabric as the Express Yourself Wrap only thinner. Very cute sweater but it was $88 and a little pricey for me for something thin. You can see the Wish Blue one in the picture below is quite sheer. Multi State of Mind Print. Love this and so do you, I just know it. That’s why it sold out so fast on the website. New Silverescent Luon items! Anti Stink bonded silver yarns incorporated into the Luon. Feels a lot like a cross between Luon and Luxtreme. I saw lots of items in this new fabric such as leggings (wunder under type pants), a jacket (Challenge Jacket), a few tanks. 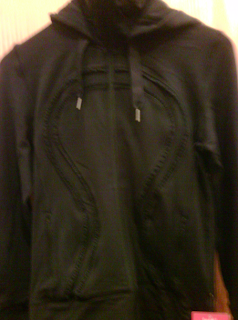 Everything was black and the seam details reminded me of items the Lulu Lab has produced over the summer. "The Oprah Effect on Lululemon."